The Fantastica crew: One Mint Julep, Nogood Nick and Phast Phreddie the Boogaloo Omnibus. ¡FANTASTICA! is the latest creation from the genius laboratories of WANG DANG DOODLE Productions. It incorporates the juxtaposition of three distinct DJs, each with his or her own style, attitude and approach to selecting recordings for an evening’s dining, dancing and drinking pleasure. On Friday March 25, the first ever ¡FANTASTICA! took place when One Mint Julep, Nogood Nick and host Phast Phreddie the Boogloo Omnibus brought their respective collections of 45 RPM records to the Commodore and played them at an appropriate volume and in an appropriate order. One Mint Julep first came to the attention of the BOOGALOO BAG writers back around 2012, when she made an appearance at a BIG TEN INCH party, back when it was still being held at the Bell House. She played some incredible hillbilly records that completely wowed the place. Since then, she has been one busy gal: She now has her own radio show on WFMU (Honky Tonk Radio Girl, Wednesday nights at 8pm); a DJ night with Mr. Fine Wine at the Robert Bar where they play popcorn records; and another night, also with Mr. Fine Wine, where they play great soul records at a joint called Friends and Lovers. PLUS! She is now married to Mr. Fine Wine and that must make her Mrs. Fine Wine! So you know she’s got great records and she knows how to play them. At ¡FANTASTICA! she played rockabilly, hillbilly, popcorn, soul, funk and, if memory serves, perhaps a doo wop record or two. 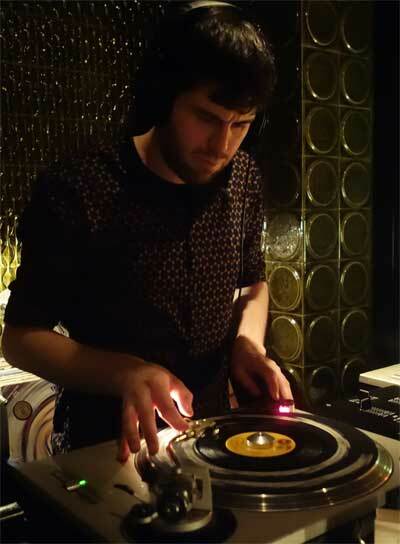 Nogood Nick is often found in the BOOGALOO BAG for the simple reasons that he is one of the most amiable DJs, has great records and he knows how to get the place swingin’ with said great records. What else is left to say about him, except his Rip! Rig! Panic! 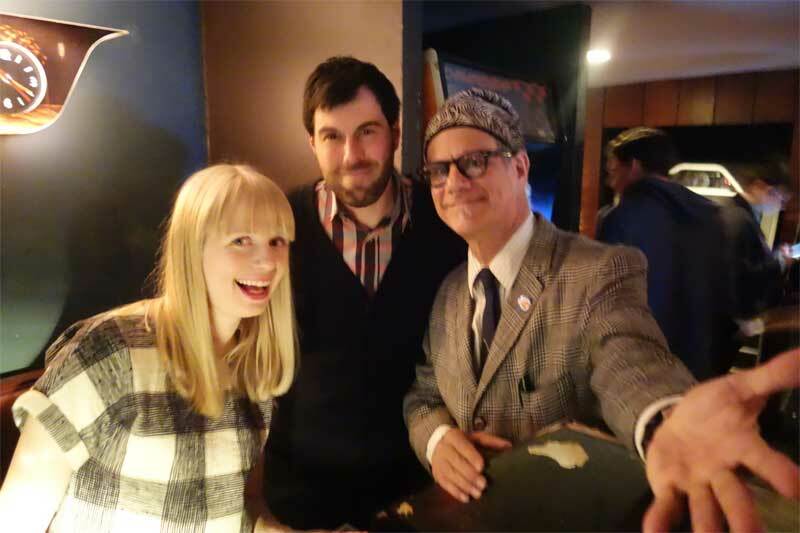 night at Otto’s Shrunken Head is the best happy hour event in town. The BOOGALOO BAG writers try to make that scene each month. After only two excellent sets, Mr. Fine Wine had to drag One Mint Julep out of the club—they had a plane to Detroit to catch at 0-dark-hundred the next morning. This was a bummer, but Nogood Nick brought extra records and he and Phast Phreddie the Boogaloo Omnibus continued the ¡FANTASTICA! through the night and into the wee hours of the morning. Nogood Nick played saucy soul music and tough organ grooves. The Phast Man swung with rock’n’roll, R&B, blues and the usual trash. Around 4:02 AM the great big bouncer came over and pulled the plug. But what a night! Folks were dancing and romancing the entire time. Man, if this ¡FANTASTICA! gig happens again, you really want to make that scene. Fine Wine, aged twenty years! Mr. Fine Wine and Phast Phreddie the Boogaloo Omnibus swing at Botanica! As this is being typed, the Boogaloo Bag writers are listening to a fabulous radio show: Downtown Soulville on radio station WFMU, hosted by our pal Mr. Fine Wine. For one hour (from 8 to 9pm NYC Time) every Friday Mr. Fine Wine plays some super fantabulous soul, funk and R&B records. Listeners wish the show was longer—maybe five hours longer! Well, if you want to hear that many of Mr. Fine Wine’s soul, funk and R&B records, we suggest you make it to Club Botanica every Wednesday night from about 9:30 or 10:00 to who knows when. It’s a groovy little joint on Houston Street in New York City that is managed by folks smart enough to ask the best soul music DJ in the world to lay down some funky mid-week sonic atmosphere. 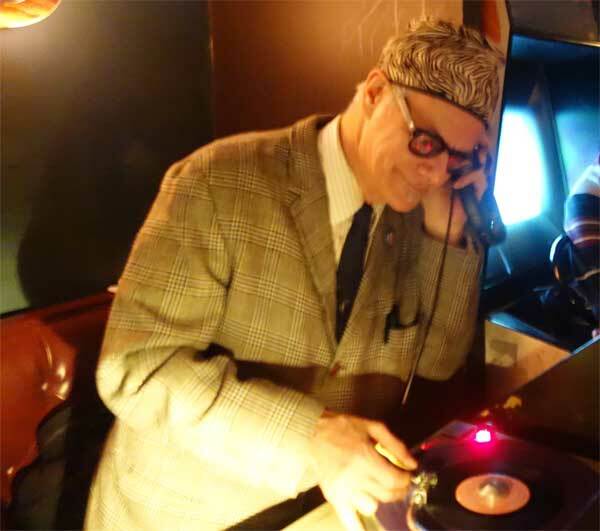 So there he is: Mr. Fine Wine, playing his great records—and he has been doing it for 20 years! The Boogaloo Bag writers try to make the scene when they can, but alas, it is on a school night, so sometimes they just sit at home and listen to their own soul records. Somehow, it is just not the same; Mr. Fine Wine has way better records! Anyway, 20 years is a LONG time for a DJ night to take place—especially a weekly one. Much congratulations are in order for Mr. Fine Wine for keeping the place jumpin’ with such fine records over all these years. This is truly a tuff task to ask of anyone, but if anyone is up to it, it is Mr. Fine Wine. On Wednesday, March 23, he celebrated this feat and quite a few of our friends were on hand to celebrate with him. Botanica was full of beautiful people when Mr. Fine Wine celebrated 20 years at the club! Several of Mr. Fine Wine’s DJ friends were asked to participate (each swingin’ with a 15-or-so-minute set) including Warren Lee (of the late, lamented Empire State Soul Club), Jonathan Toubin (New York Night Train) and Chairman Mao (Bumpshop), all of whom the Boogaloo Bag writers missed because they left early. 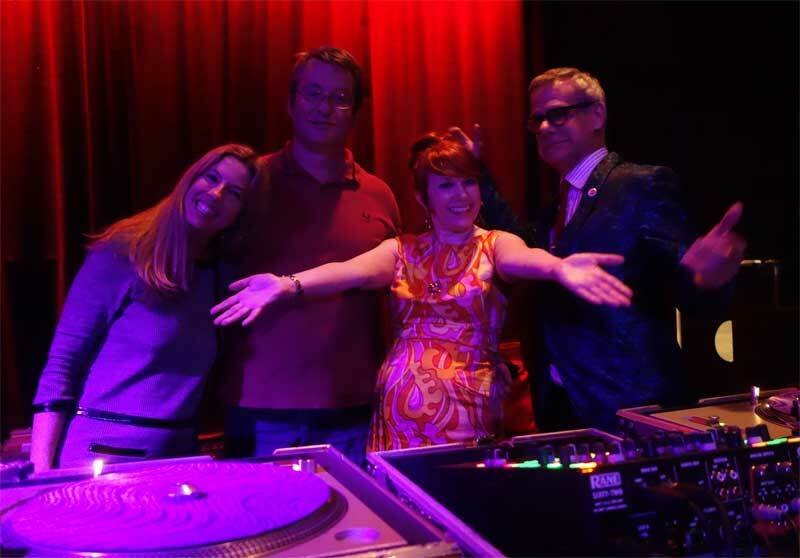 However, they were able to witness the most excellent DJ skills of Drew Redmond (Finger Lickin’ Fridays), Greg Tormo (Solid Hit Soul Club), Sean Connors (Friends and Lovers Soul Night) and the lovely Connie T Empress (Empire State Soul Club). Also in the house, and they may have participated, was Mikey Post (Daptone) and Young Chris (Thee Knights of the Turntables); probably others as well, but in the dark confines of Botanica, the Boogaloo Bag writers couldn’t recognize them! As the Boogaloo Bag writers were leaving, One Mint Julep (aka Honky Tonk Radio Girl, aka Mrs. Fine Wine) was preparing her set. It was a shame to miss it, but, as mentioned, it was a school night. 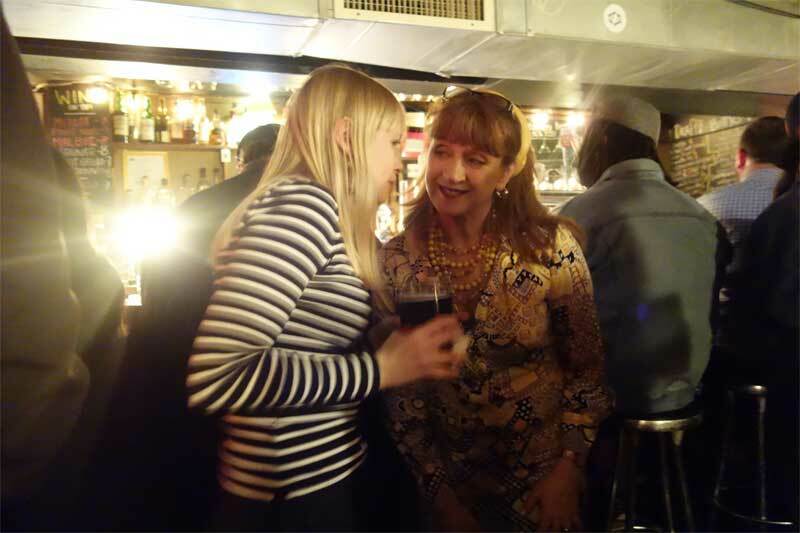 One Mint Julep and Connie T Empress discuss the finer points of Popcorn records at Botanica! 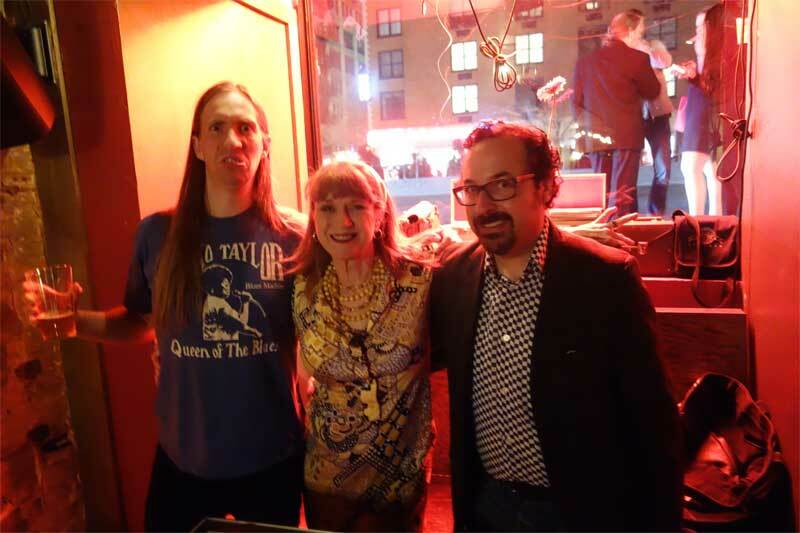 Drew Redmond, Connie T Empress and Greg Tormo swing at Botanica! Once again: Hearty congratulations to Mr. Fine Wine for 20 years of playing soul records at Botanica!!! Connie T Empress congratulates Mr. Fine Wine for 20 years of service to the cause! Tony Salvaje and Phast Phreddie the Boogaloo Omnibus swing at WHAM-O WATUSI! 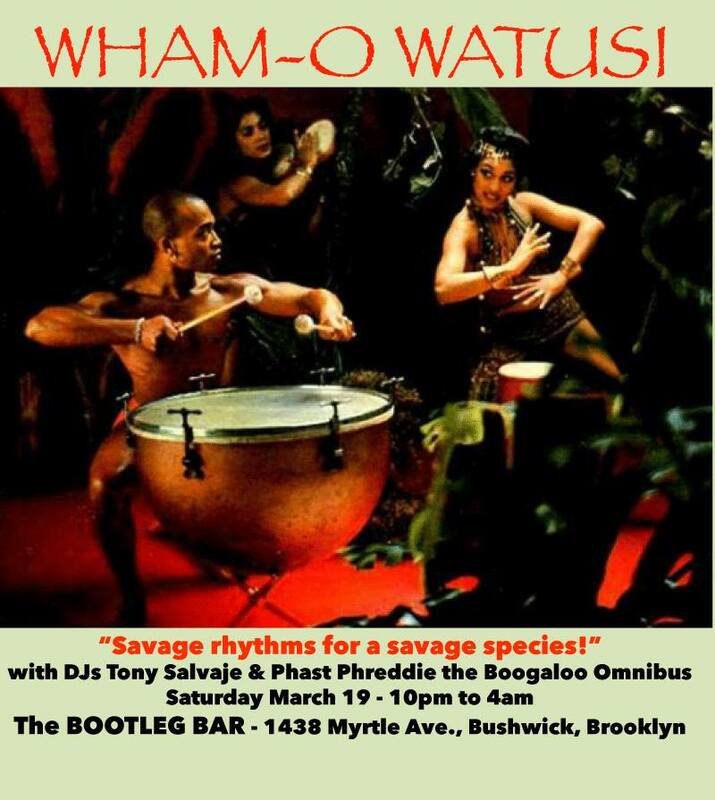 The international aspect of The WHAM-O WATUSI nights at the Bootleg Bar continued on Saturday March 19 when the guest DJ was Tony Salvaje, an expecially adept DJ who was born in El Salvador. 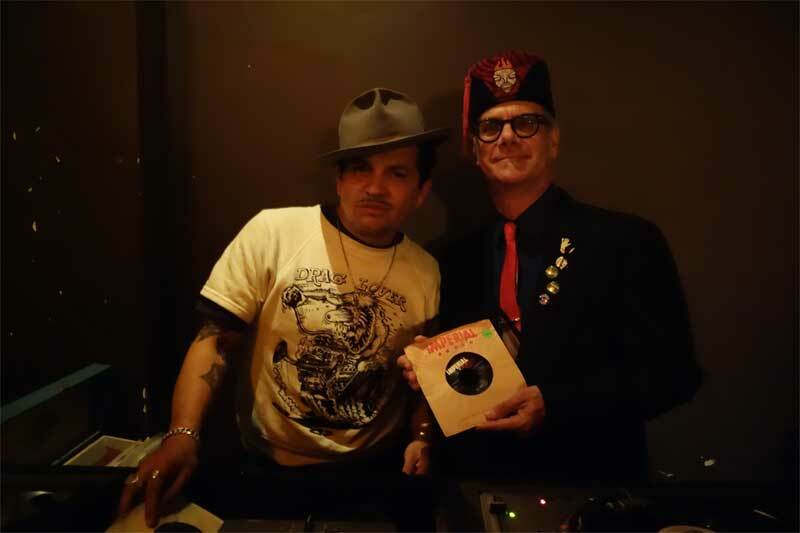 Tony Salvaje played some great records at WHAM-O WATUSI! 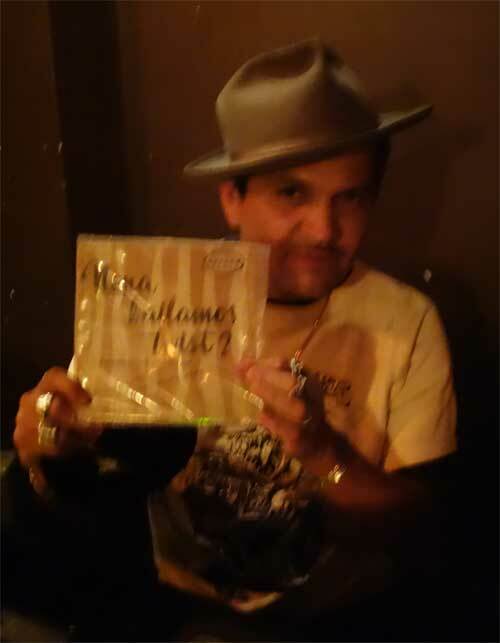 Tony Salvaje shows off one of the fine records he played at WHAM-O WATUSI! Mr. Salvaje came to this country as a teenager and has since lived and DJed in Los Angeles and Seattle. 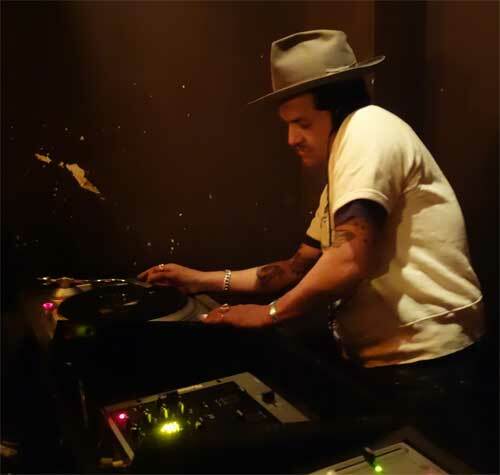 His playing of fantastic rock’n’roll records is quite notable, and since moving to Brooklyn, he has often worked turntables at the fabulous ABC Rebel Nights and Shake It Up Sundays—two of the City’s best dance parties. On this particular night, Mr. Salvaje rocked the house with his tremendous records, including those by acts from Peru and Mexico. He had the place jumpin’ all night. We hope to see him back at the WHAM soon. This month’s WHAM-O WATUSI took place on the third Saturday of the month, trading with our pal Drew Redmond who usually holds forth at the Bootleg with his Sleaze to Please night, in order for host Phast Phreddie the Boogaloo Omnibus to take part in the Subway Soul Club festivities on the first Saturday of March. The WHAM will return to it’s regular night in April (the 2nd) and, in keeping with the international jet-set theme of this year’s WHAM-O WATUSI scene, the special guest will be DJ Rata, a superb DJ from Venezuela who now lives in Brooklyn. He digs the rock, the bop and the mambo; and so will you. Be there! 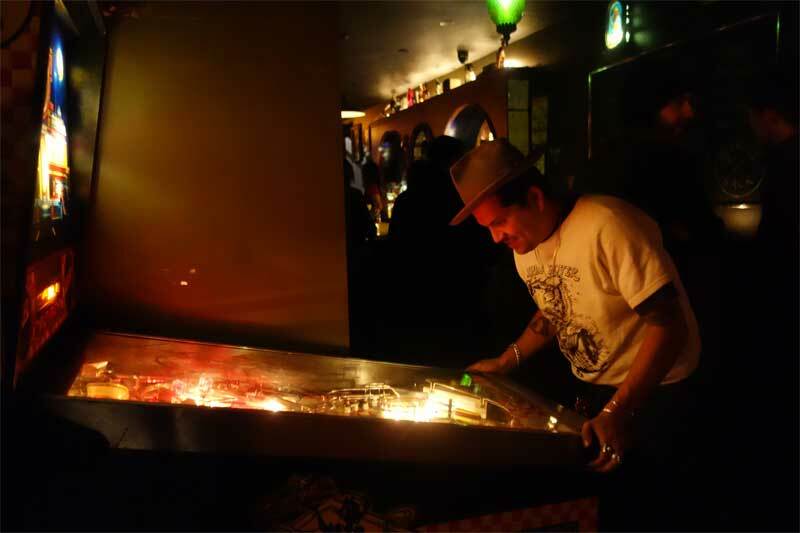 Between his DJ sets, Tony Salvaje scored a replay on Bootleg Bar’s groovy pinball machine at WHAM-O WATUSI! Subway Soul Club Springs Into Action!!! 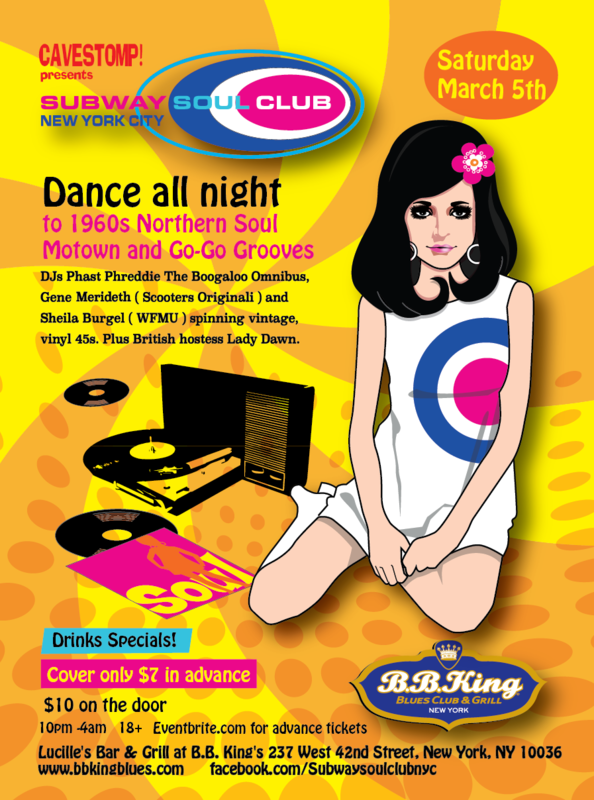 Subway Soul Club is the most fabulous sixties soul music dance club in New York City. Others have come and gone, but the Subway Soul Club, although not nearly as active as it was when it was held monthly, can still deliver the goods whenever hostess Lady Dawn decides it’s time to swing. 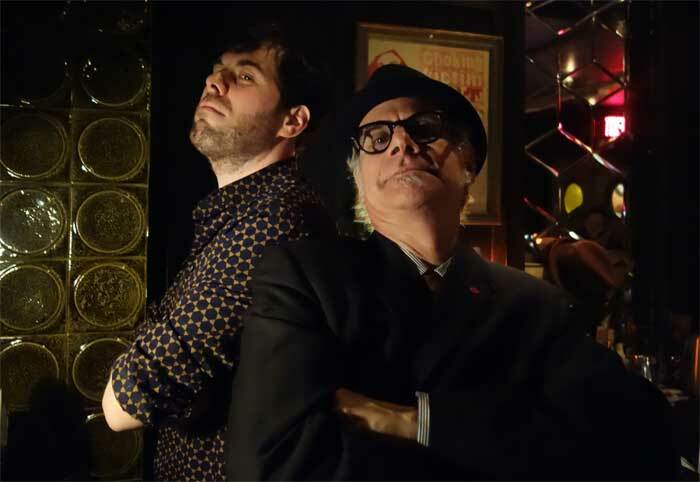 On Saturday March 5, Subway Soul Club, with the aid of our friends at Cavestomp, held an event at Lucille’s, the comfortable room adjacent to BB King’s Blues Club on the edge of Times Square. This is what a night out is all about: going to Midtown to dine and dance and have a good time with good friends. This is why we live in New York City: because sitting at home on and watching TV on a Saturday night is for squares! This is heaven for all the hip cats and kittens who attend. The elegantly appointed Lucille’s, with its large dance floor, excellent food (yes, Lucille’s has a complete menu on which to dine!) and professional staff, is the perfect place for it to happen. 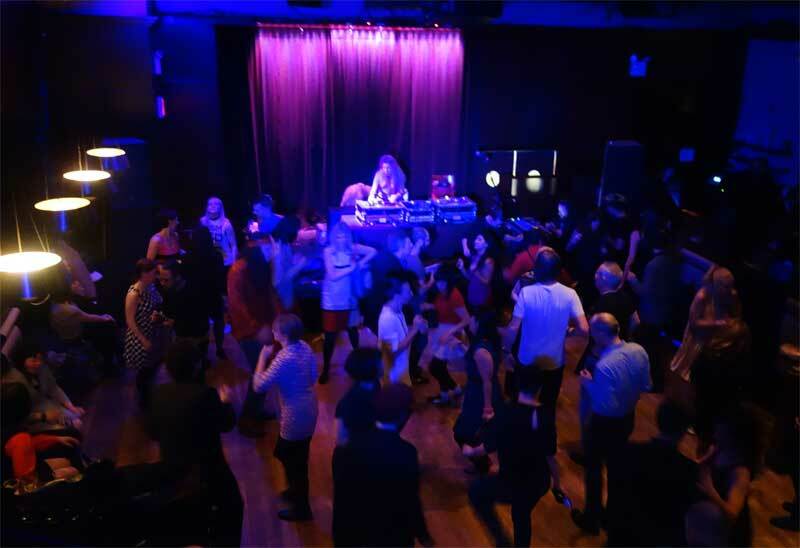 The scene on this particular Saturday night was made ever more marvelous by the expert DJ efforts of the guest DJs: Gene Merideth and Sheila B.
Gene Merideth swings at Subway Soul Club! 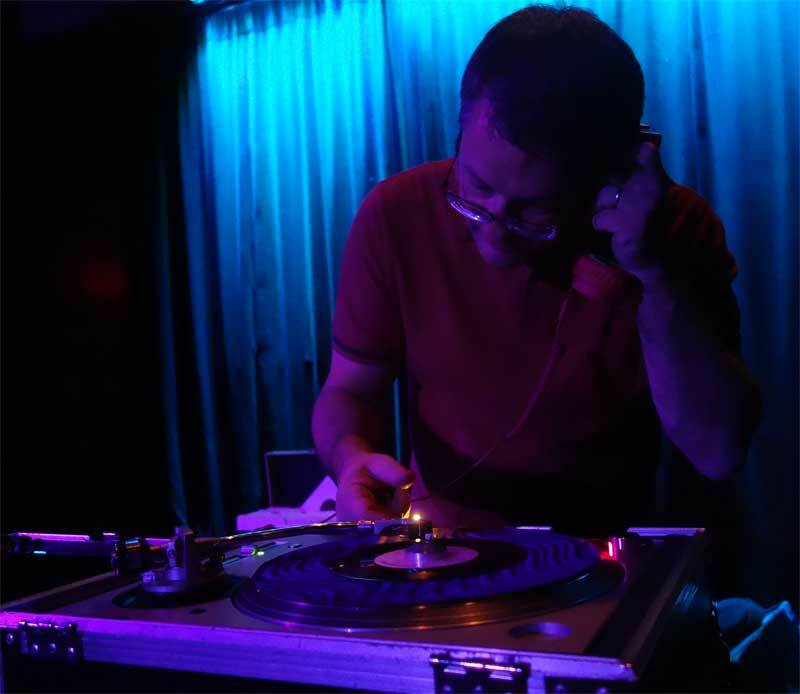 Gene Merideth has been one of the Subway Soul Club’s favorite guest DJs since its early days back at the late, lamented Club Rififi. 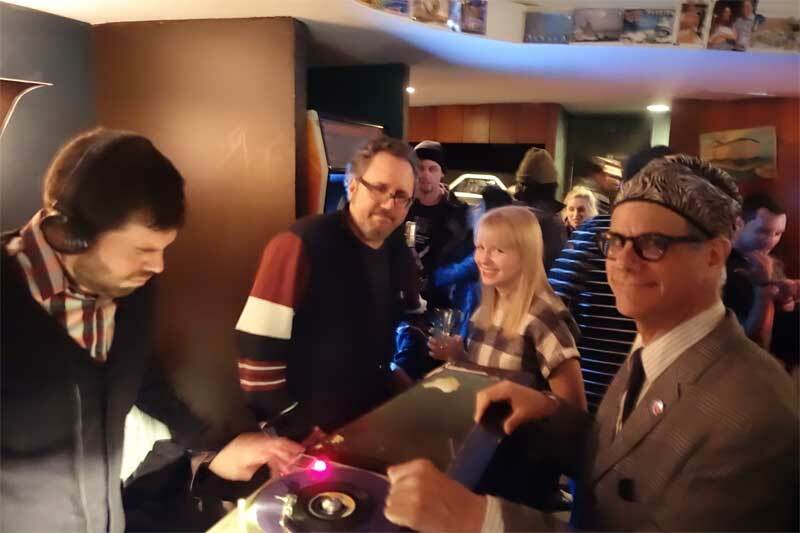 Nowadays, Mr. Merideth keeps himself busy on the vintage scooter scene (his company Scooters Originali repairs and restores vintage Vespas and Lambrettas) where he is often seen DJing at rallies. A few years ago he moved to the Lehigh Valley area of Pennsylvania and DJs monthly at Porters Pub in Easton. 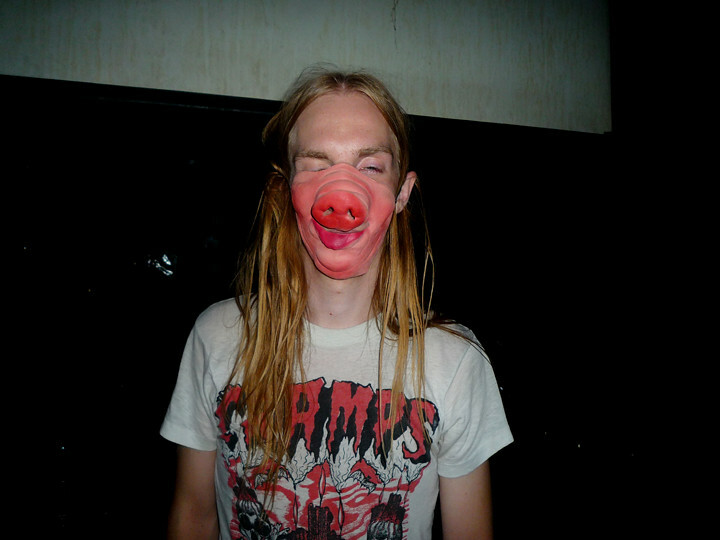 He tells us that he finds good records in the area. 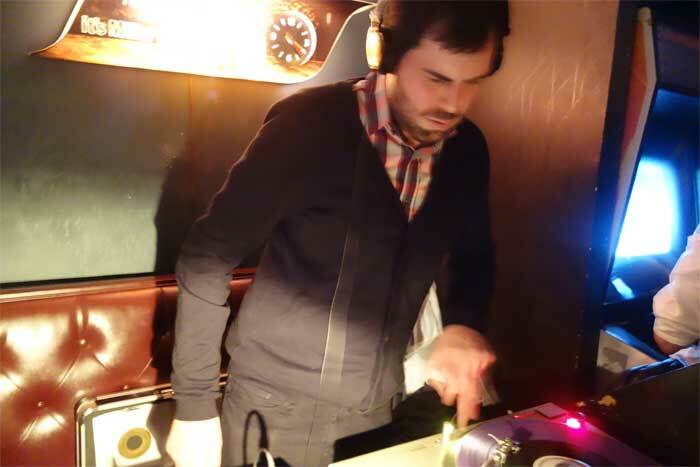 Judging by the sound of the sets he played at the Subway Soul Club, he is finding GREAT records! Sheila B swings at Subway Soul Club! 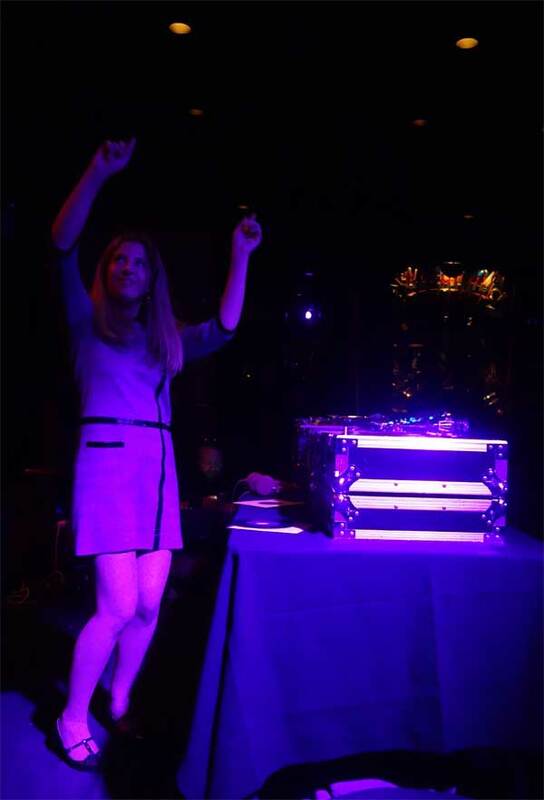 Sheila B is one of the most busy and popular DJs around. 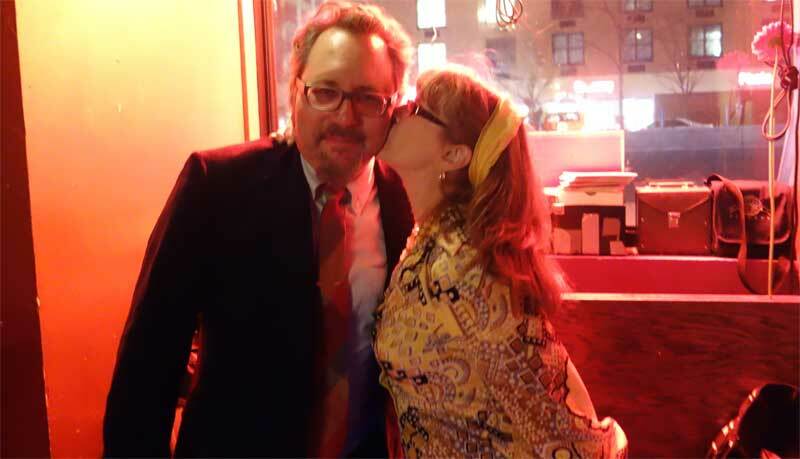 Last year she started her highly entertaining, educational and eclectic Sophisticated Boom Boom radio show on WFMU (heard every Friday from 3 to 6 PM). On the third Friday of the month she plays hostess at Our Wicked Lady in Bushwick with her Sh-Boom DJ night. She is the curator for a girl-pop-centric web-o magazine called Ch Cha Charming (every Boogaloo Bag reader should check it out). Also she is the producer of finely crafted re-issue compilations of girl group wonderment, most recently Love Hit Me! Decca Beat Girls 1962 – 1970. 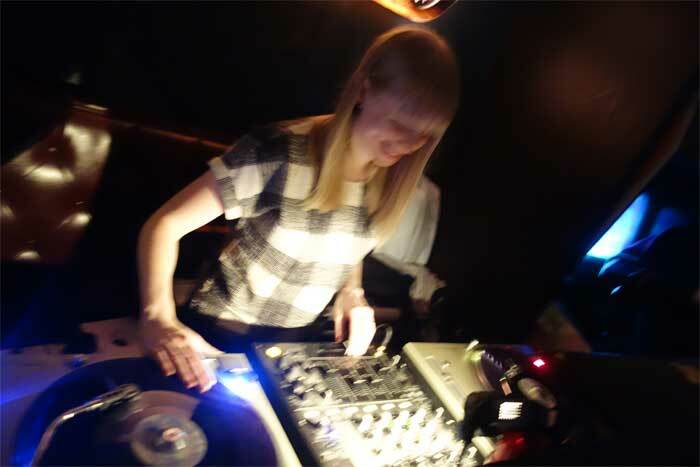 She knows her stuff, that’s for sure, and she proved it live and in person when she played records for Subway Soul Club! Lady Dawn swings at Subway Soul Club! The event itself was a blast. 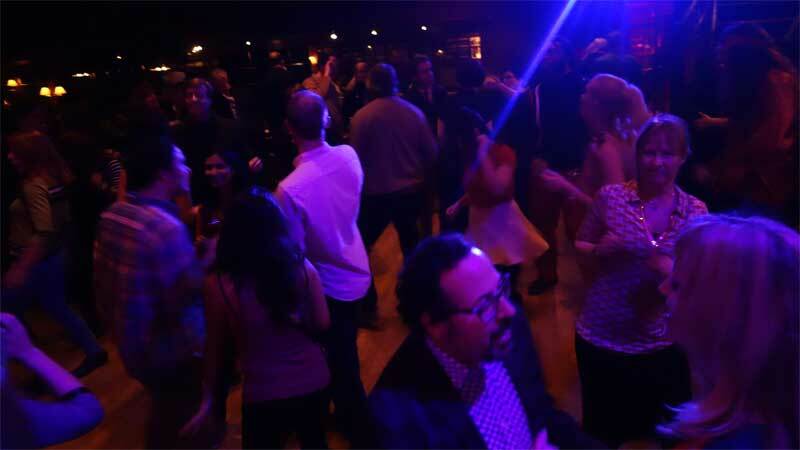 The dance floor had activity going the entire night. The DJs all played fabulous records. A lot of our favorite familiar faces showed up to watusi, including filmmaker Rachael Guma who was celebrating a birthday. Also, there were plenty of new faces that we hope to see next time. Next time, indeed! When will the next Subway Soul Club take place? Only hostess Lady Dawn knows for sure. She has been very busy with her own design business that we will be lucky to see another one this year. However, resident DJ Phast Phreddie the Boogaloo Omnibus is going to push to have one in June or July and perhaps one in November. Let’s all keep our fingers crossed on that! 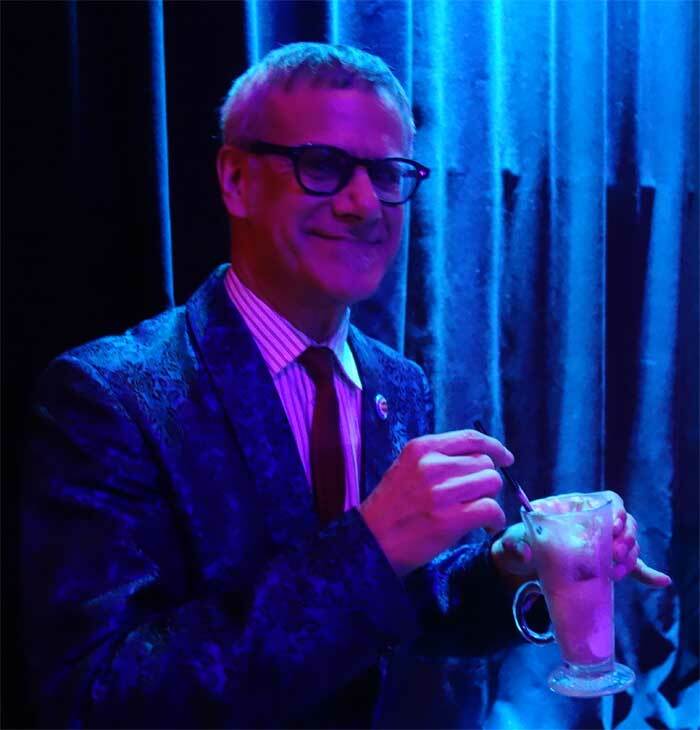 Speaking of the Phast One, he celebrated the amazing music being played that night by drinking one of Lucille’s fine root beer floats! He also played a couple of records, including salutes to the recently passed Clarence Reid and Maurice White (The Salty Peppers). The Subway Soul Club Crew: Sheila B, Gene Merideth, Lady Dawn & Phast Phreddie the Boogaloo Omnibus. Phast Phreddie the Boogaloo Omnibus toasts Subway Soul Club with a root beer float!! Nogood Nick and Phast Phreddie the Boogaloo Omnibus swing at Rip! Rig! Panic! Nogood Nick cues another Mod Jazz groove at Rip! Rig! Panic! Rip! Rig! Panic! is one of the Boogaloo Bag’s favorite events. Hosted by our friend Nogood Nick, it presents moderniste jazz along with sweet soul music in a manner that is very pleasing to the ear. It was for that express reason that Nogood Nick was often asked to guest DJ at the late, lamented DYNAGROOVE. Usually the Rip! Rig! is held on the second Friday of the month during the happy hour at Otto’s Shrunken Head. However, On Saturday February 27, a very special Rip! Rig! was held at a new joint in Boerum Hill, Brooklyn called the Robert Bar. Guest DJ was Phast Phreddie the Boogaloo Omnibus. The Robert Bar is groovy. 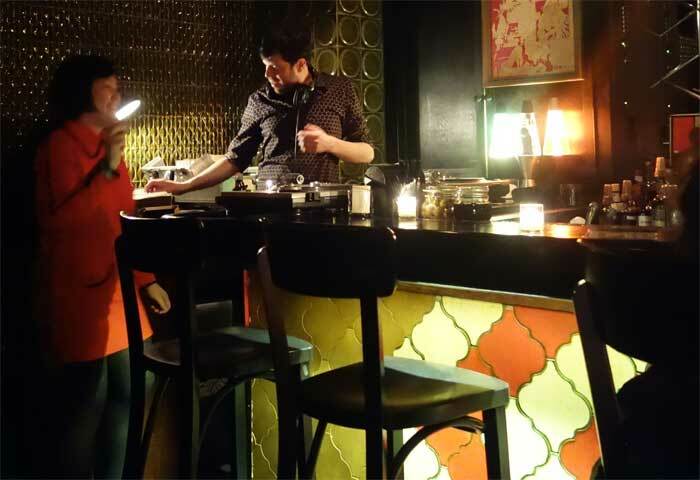 It is outfitted with a marvelous décor, including three working lava lamps next to the DJ booth, and the walls consist of decades old tiles from around the world. The ceiling is made up of thousands of dominos. The swingin’ sounds, funky rhythms and organ grooves of the Rip! Rig! Panic! fit the Robert Bar perfectly. Our pal Yana Lil’ Jerk, who appears often in the Boogaloo Bag, dropped by to hang out and she became noticeably animated whenever a rocksteady beat emanated from the speakers. Yana Lil’ Jerk and Nogood Nick discuss the proper method of selecting 45 RPM records at Rip! Rig! Panic! 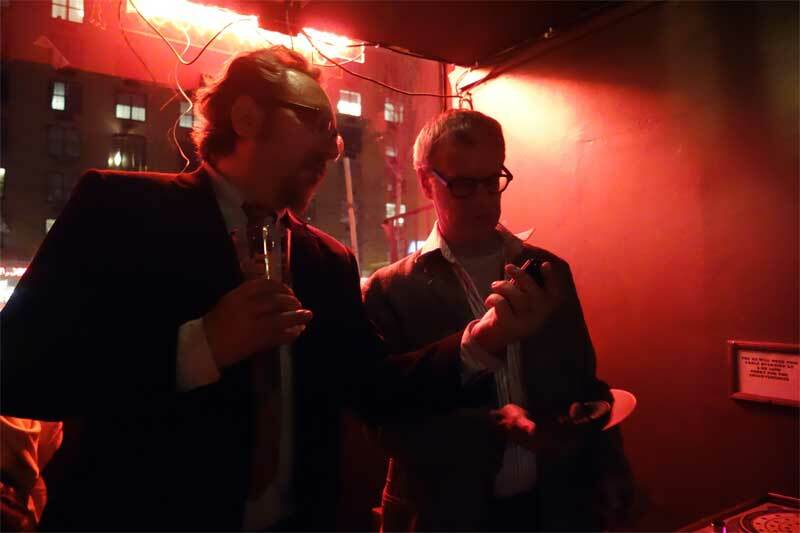 The owners of the Robert Bar seemed to be very pleased with the audio atmosphere developed by Mr. Nick and Mr. Boogaloo, so we expect them to be asked back soon—together or separately either way, it will be a gas and a half and all Boogaloo Bag readers should make the scene.